What made you decide to have a dragon boat race for charity in Carolina Beach? We had talked about a Regatta as a charity event for some time but a Sailing event would have been off shore and our yacht basin and marina is not even setup to handle Sailing vessels. I felt a Dragon Boat Race would add something new that our community had not seen before but would also foster teamwork and camaraderie within our community. We also felt it might be an event which could attract out of town visitors including participating teams to visit our beach town in the off season. There is a buzz around town about the event that I have not seen before and we expect it to be a great spectator and participant based race. Have you ever paddled any type of vessel similar to a dragon boat before? No. I have rowed before but never paddled. This will be my first experience with dragon boat racing and paddling. What makes Carolina Beach a good place to hold a dragon boat race? We are a beach resort town with a great wide sandy beach to enjoy and a nice protected yacht basin which ends at a bulkhead marina. The area in which the race will take place is a part of the Yacht Basin lined with homes and condos built along the waterway with marinas and docks lining both sides of what appears to be a channel. We also have facilities for live music and a centralized area for a festival with lots of parking all within a couple block walk of the ocean and our small boardwalk area. Our Marina area offers seafood restaurants, fast food restaurants and retail shopping. Hotels and motels are one block or two blocks from the marina where the event will be held. The last thing is our residents are great people and you will enjoy the great hospitality that every participant and visitor will experience. 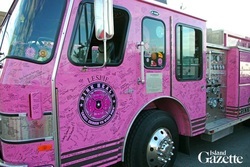 Since it is Breast Cancer Survivor Month, is the Town of Carolina Beach doing anything in particular to recognize the cause? 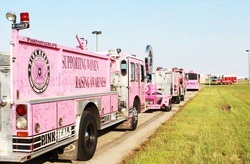 We had the Pink Heals Tour (Pink Fire Trucks) visit our town just two weeks ago and also sponsored a toes in the sand breast cancer awareness event. Our Fire Department will be wearing and selling Pink T-shirts and we will be promoting Breast Cancer Survivor Month at the event. What are the charitable proceeds being raised for at your event on October 26th? 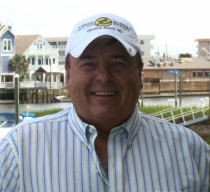 Our charitable proceeds are going to be split between the Carolina Beach Volunteer Fire Department and our Got-em-on-live-bait Club charities (Help Center, Senior Center, Disabled Fishing Tournaments).